Detroit, Michigan - A neighborhood resident pushing a shopping cart walks by Collins Park, where the Environmental Protection Agency is removing lead-contaminated soil. The contamination was discovered by a crew installing new playground equipment. 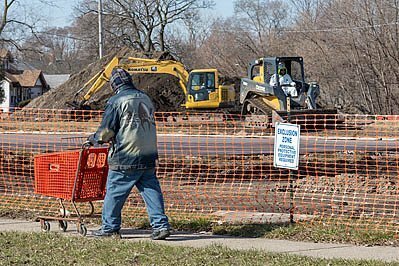 Image Description: Detroit, Michigan - A neighborhood resident pushing a shopping cart walks by Collins Park, where the Environmental Protection Agency is removing lead-contaminated soil. The contamination was discovered by a crew installing new playground equipment.